A free download, MobiTV delivers round-the-clock news from ABC as well as on-demand content from Fox News, NBC News, and NBC Sports. You can also use the app to watch stand-up comedy and classic cartoons free of charge. But your choices become more plentiful should you opt for one of MobiTV’s different pay schemes. For premium content, you can make an in-app purchase of a one-, three-, or six-month package that features eight channels of live TV and 30-plus channels of on-demand content. These channels include live news on MSNBC and FOX News, financial and business news on CNBC and FOX Business, and full-length shows on MTV, Comedy Central, Disney Channel, NBC, VH1, ABC Mobile, Nickelodeon, SyFy, USA Mobile, CBS and others. 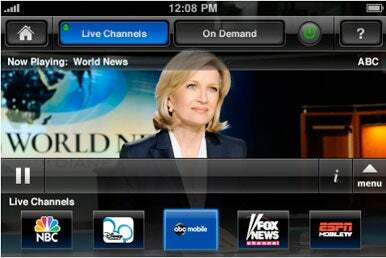 Content can be streamed both on Wi-Fi and 3G networks. Pricing starts at $10 for the one-month package, with three- and six-month offerings available for $25 and $45, respectively. It will be interesting to see how MobiTV’s iPhone-only app fares, especially as Apple’s iPad attracts developers offering streaming-content apps. ABC Player lets iPad users watch a number of that network’s shows for free, while the Netflix iPad app offers streaming TV shows and movies to subscribers with a Netflix unlimited membership.